CLICK HERE for the most updated operating calendar. Don’t forget to book your discounted stay at the LEGOLAND California Hotel! Join your favorite ninja heroes at a very special dojo training session in the new LEGO® NINJAGO®: Master of the 4th Dimension 4D film opening January 12th inside LEGOLAND® California Resort! Become part of the 4D action as Master Wu prepares the ninjas to take on the teachings of the mysterious ‘Scroll of the 4th Dimension’ but with disastrous consequences. LEGOLAND has more than 60 rides, shows and attractions including, LEGO NINJAGO World! Ninja work to become masters of the ancient art of Spinjitzu and demonstrate what they have learned on the new LEGO NINJAGO The Ride. This technological marvel allows riders to control animated fireballs, lightning, shockwaves and ice. Join the crew on the LEGO CITY®: Deep Sea Adventure submarine ride to discover real sea-life and treasure that’s now open! Inside LEGOLAND, you can enter a world of knights and princesses to conquer the Dragon Coaster. Kids can drive their own cars at Driving School. 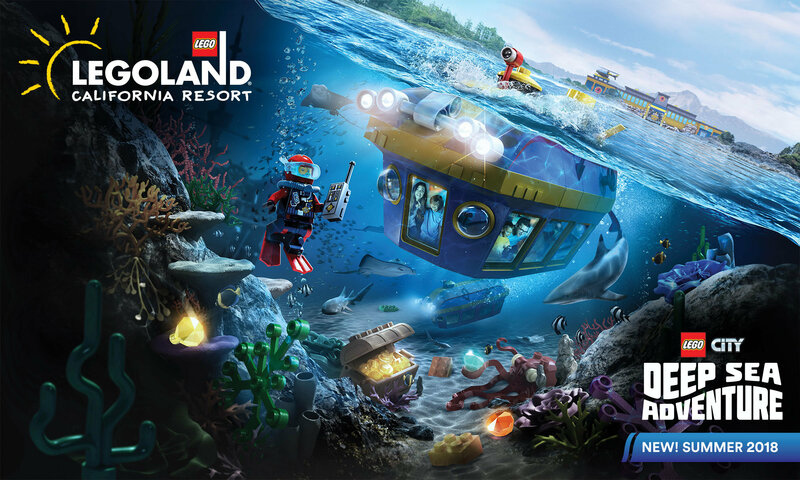 The Resort is also home to the LEGOLAND Water Park featuring the LEGO Legends of CHIMA™ Water Park. Right next door is the SEA LIFE® aquarium with the new Sea at Night display coming this spring. There’s so much to do, you’ll want to spend the night. The amazing LEGOLAND Hotel is packed with themed LEGO features and the new LEGOLAND Castle Hotel is now open! For Resort information visit LEGOLAND.com.